Honoring and Reverence: come from acknowledging and giving thanks to the moment, people and things. I recently attended a workshop for Asian women exploring voice, magic, ritual and alchemy that opened me up to so many great tools! Since that workshop I've had a new desire to incorporate more ceremony, blessings into my space, ritual and setting clear intentions about what I want to invoke in and what I want to let go of. I have been pulled to make magical potions, search for medicinal plants in the wild, take mind altering herbs, pull tarot cards, make tinctures, and create my own medicine out of rocks and feathers and rose petals. As these desires have come through, what also came up was my fear of not "doing it right". My knee jerk reaction was to think that I needed something outside of me that would help me know the words ceremony, sacredness, honoring, and reverence before I could actually do them for myself. I often consult people, things, ideas, and the internet before I ask the simple question. What feels "right" for me? What does _____mean to me? With so much information out there on how to get it “right” or what the correct formula is, I can forget to check in with myself and see what knowledge I already have inside. Ultimately I get to be the one who decides what all those words mean to me. Who says I can't make it up as I go? This week on the podcast I'm talking about how I am incorporating more ceremony and ritual in my life and making it up as I go by asking "what might bring joy in this present moment?" 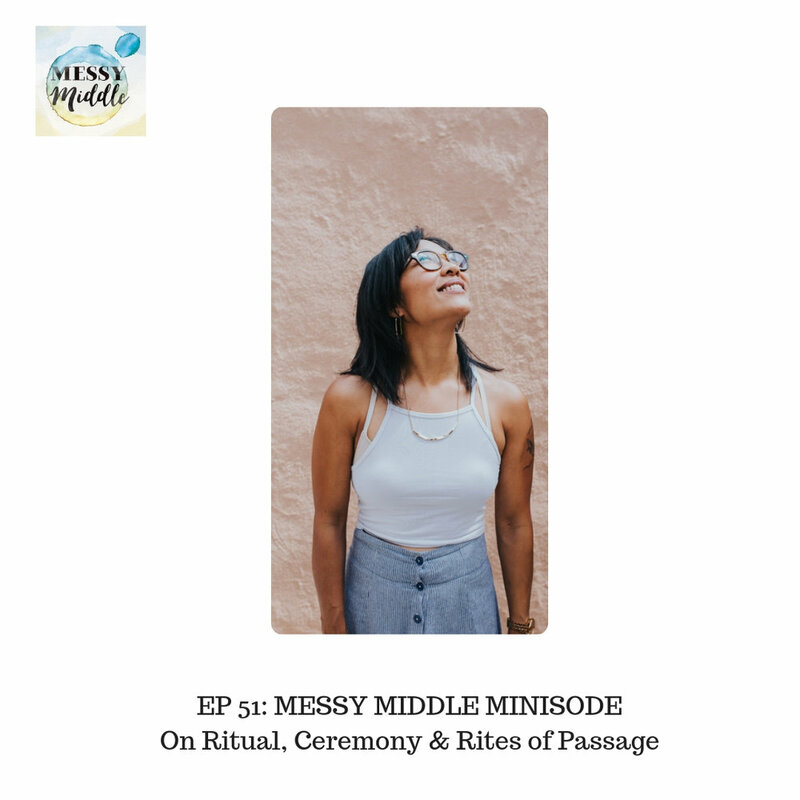 I hope you enjoy this Messy Middle Minisode and find some creative, playful ways to incorporate ceremony, ritual, and sacredness in your life.